If you haven’t heard about the big Seahawks win at Super Bowl XLVIII last night, you’ve been living under a rock. Good game ... but the main event, obviously, was the halftime show. If you happened to catch the Bruno Mars/Red Hot Chili Peppers halftime show, you were given a real treat. When the lights went down, the stadium lit up, and not by any ordinary lights. 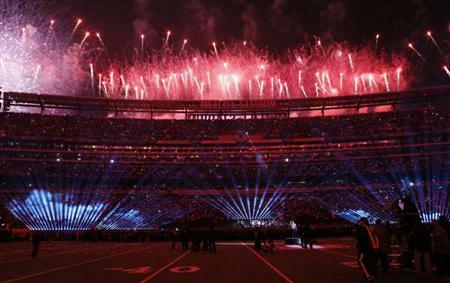 PixMob, a Montreal-based firm, unveiled its wireless lighting technology on Sunday with the help of all the Superbowl XLVIII attendees. The company supplied each of the 80,000 ticket-holders with a black tuque embedded with PixMob’s LED technology. Essentially, the hats lit up to transform the entire audience into a huge display screen. The result? It. Looked. Amazing. How does it work? The LED lights on each tuque create a flash mob of pixels where each person wearing the tuque becomes a small dot of illumination. All of these little LED lights blend together, allowing the audience to become the ideal backdrop to the halftime show performances. PixMob had control over the lights embedded in the tuques so that, through transmitters, they could create multicolor effects to the beat of the music. Super Bowl XLVIII, which was held at the sold-out MetLife Stadium, was the ideal venue for this visually-stimulating light show to come to life. Seriously, how cool would it be to take part in the first-ever human video canvas? According to PixMob chief executive David Parent, all those who attended the game made history, as they were all part of creating the biggest LED screen ever. “It’s a big milestone for us,” said Parent as he referred to the Super Bowl as the “Holy Grail” for the Canadian company. For the past seven years, they have brought their interactive light shows to concerts, parties and productions around the world, but nothing like this. “The PixMob experience is about taking the show from the stage to the stands, uniting people through shared experiences and reinventing rituals,” said Parent. Who knows? This interactive LED technology could be the start of how artists incorporate the audience into their shows. It’s certainly a step up from those little ravers jumping around with glow sticks in their hands.